Did you walk to school when you were growing up? I did, and so did my husband, Jim. I remember shuffling through leaves, splashing in puddles, and the coolness of leafy shade. Jim’s route to school in Walpole, New Hampshire, took him one mile along town-maintained sidewalks. Jim recalls those 20 minutes as a sociable way to start the day. It was a routine: he and his brothers occupied a regular place in the daily flow, and they expected to see the same kids out in front of them every day, the same group behind them. To vary the routine, he might peel off to take a longer, quieter side route; or a new kid might join the pack. He also remembers looking forward to fourth grade, when the school allowed children to ride their bikes. What he doesn’t remember is ever arriving at school in a car. In 2009, less than one child in five regularly walks or rides a bike to school. The school day in many communities starts with long lines of cars dropping off children right at the entrance. I can guarantee you that sitting in some of those idling cars are parents who think back to their own school days and wonder, What happened? How can I guarantee you this? Because I’m one of them. What happened? Here’s a short and incomplete list: parents’ (increasingly, both parents) work commutes expanded; communities stopped building or maintaining sidewalks; with fewer adults at home during the school day, neighborhoods stopped feeling safe, or even neighborly; children’s schedules became more complicated; traffic in residential areas increased and moved at faster speeds; schools moved away from town centers. And the landscape of childhood shrank accordingly. Here’s some good news: Since 1997, when the first national Walk to School day was held in Chicago, walking or riding to school has become what you might call a socio-indicator — a quick way to tell if a community is livable and if children in that community have a good chance of being healthy. Parents, schools, community leaders, and policy makers are paying attention: “Safe Routes to School” legislation passed in 2005 to fund programs on the state level. October is International Walk to School Month. One walk in 1997 is now thousands of events nationwide, involving more than 3,000 schools. In many communities the effort has expanded far beyond one day, or even one month: In Somerville, Massachusetts, parents chaperone walking “school buses” on the last Friday of each month. Roaring Brook School in Avon, Connecticut, holds a “walking bus route” every Friday during the school year. Children who live behind the school can walk a newly cut trail through the woods, and “bike rodeos” that teach bicycle safety are held in the upper school. Often when I think about connecting children to the outdoors, the picture I have in my mind is a hiking trail or a mountain stream. Research increasingly shows us, though, that regular, everyday experiences in the outdoors — things as simple as walking to school — are the best ways we can create lasting connections with the natural world for our children. Learn more about International Walk to School Month. A clickable map lists 2009 events in all 50 states. The site also includes resources for organizing similar events in your community, including Walkability and Bikeability Checklists. 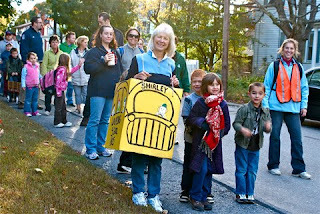 Photo: Suzanne Mahoney, principal of Lura White Elementary School came in costume — as a walking school bus, of course — to the Shirley, Mass., school’s walk-to-school day on October 7. Mahoney joined 180 children and adults on the walk.